Good morning and a Happy Monday all around! Just a wee update this morning to discuss some weekend stitching. Initially, I called this an experiment, but it worked, so I’m keeping it. When it comes to surface embroidery, beads are not usually part of my planning process. I like beads. But they’re rarely an integral part of my design process. If they happen, they tend to happen as an afterthought. But my vision for the design I’m working on right now included a little bit of sparkle and dimension that beads can add to a piece. So I ventured into testing different beads this past weekend. Since I don’t use beads too often in my designing process, I don’t have a wide array of the little things to choose from. But I knew I had this incredibly rich, deep blue delica bead in my small collection, and I had an inkling that I wanted to at least try it. The beads on the right in the photo above have not been run through yet with a stabilizing thread, so they’re a bit wobbly still. The ones on the left are stabilized and the line looks a bit smoother. They do what I wanted them to do. On the outer petal lines, I wanted some texture and interest, a bold definition, but not something Knotty. These particular beads, because of their squared tubular shape, keep the line from being too knotty or bumpy looking, while at the same time adding sparkle, interest, color and a little texture. Delica beads, especially when worked close together like this, hint at a mosaic look in my mind, and that notion plays well with my thoughts behind what I want to deliver with this design. There are a couple other areas on this project where I plan to incorporate a lighter use of beads. When I go forth to play with those, I’ll be testing different types of beads besides delicas. 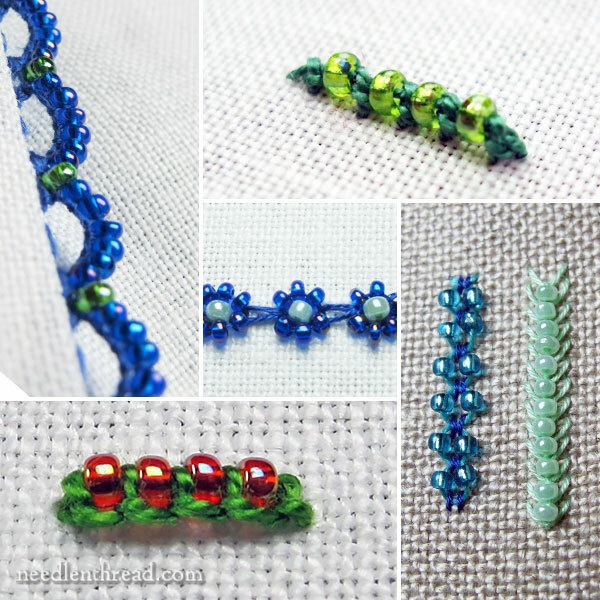 Do you have a favorite type of bead you like to use on your surface embroidery? Or a particular shape? Round seed beads? Delicas? Bugle beads? What about a favorite bead manufacturer? So far, I’ve found that Miyuki beads from Japan are fairly uniform and consistent. They strike me as particularly well-made beads. But perhaps you have a certain bead manufacturer you know of, that you’d like to recommend? Since I’m not too hip on the bead scene, I’d love some recommendations! I’m always game to try the different options out there. If you want to share your bead experiences and tell us what you’ve used, had success with, like particularly well, or want to try but haven’t tried yet, feel free to chime in on the conversation below! I’m all ears! I’ll share an embroidery pattern with you later this week. I’m also gearing up for a Big Overhaul in the workroom, once school is out. And I’m testing fabrics for constructing embroidered items, so I’ll share my explorations there, too! 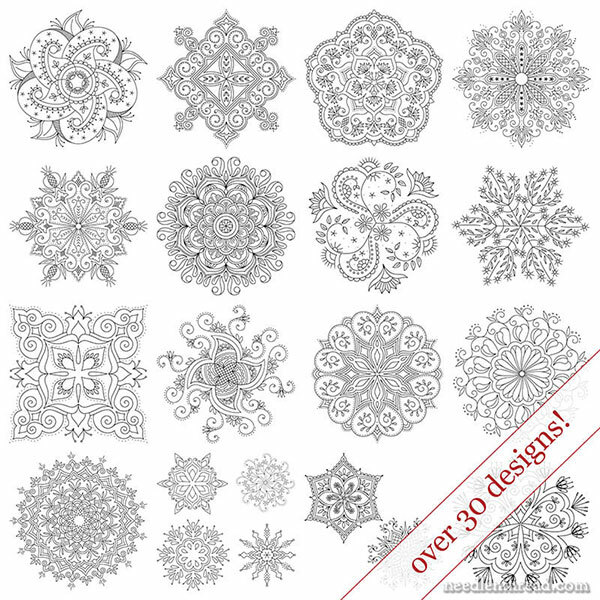 If you’d like to stitch up your own version of Party in Provence, you’ll find the pattern available in my Favorite Kaleidoscopes collection – over 30 kaleidoscope designs for hand embroidery and other crafts. You’ll also find the pattern for Birthday Bash and Tulip Festival in the same collection! August 7, 2017 Weekend Embroidery Finish…and a question! April 3, 2018 Party in Provence: Adding the Beads and Finished! I personally prefer Toho beads. They are more readily available locally and online seem to be a bit less expensive. I have been very happy with their evenness and quality. Czech beads tend to be less even and the holes are much smaller making getting a needle through them sometimes a challenge. I certainly have no shortage of beads! I love the texture and visual pop of beads, though I’ve done only one project with beads so far. Used Swarovski 3mm crystals (in cobalt & aurora) and white pearls on a huge Hardanger Wedding Sampler for a niece. After weaving, bars and filling stitches, the tiny crystals and pearls were used individually as special “filling stitches” within motifs and created a lovely effect. Wow! I’d love to see a picture of that piece. I’ll bet it is pretty incredible! I love TOHO seed beads, they are a lovely consistency and have a slightly bigger hole than some, and are so good that Mill hill (amongst others) repackages them so that embroiderers have smaller amounts than the tubes usually sold in the USA. Here in NL I buy them per 10 gr baggie which fits nicely into a 1 7/8″ fliptop box for easy storage. I like beads on a project and your beads are lovely so is your stitching. I like all types of beads but Mill Hill beads are one of my favourites but I really like shells and pearls as well, in fact I like all sorts of beads I think they compliment embroidery really well. Good luck with the overhaul on your room please show pictures and looking forward to your exploration on fabrics for embroidered items. I hope you have a lovely week. Hi Mary! I love the look the blue delicas’ added! I love to use beads in my embroidery as well; I think they add “bling” to the designs. Like you, I think the Japanese beads provide the best quality and uniform size and holes, but I do have lots of Czech beads as well since they are usually a little less expensive and there is a large assortment of colors and sizes available. My preference for using beads are in place of French knots; I never seem to be able to complete a stable French knot so I use beads instead, and I love the look the beads add. For sizing, I usually prefer the very tiny size 13 or size 15 beads when using them instead of French knots, so I have a large assortment of colors on hand for using, plus I like to add in a few “charms” to my projects as well, depending on what it is. They just add interest and texture, and Bling! Beautiful work! How did you achieve that perfectly seamless shading of palest to darker blue? It doesn’t look like the usual long and short stitch. . . .
Hi, Mike – it’s just long and short stitch. I use one strand of floss. I don’t religiously follow a long-short pattern, necessarily. Some books and instructors will teach long and short stitch with a defined long and short pattern that meticulously alternates long and short in rather rigidly spaced rows. Instead, I’m using more of a “needle painting” technique, where the structure of the long and short is a little less rigid. It helps the colors to blend better. Another tip, to get better blending: use stitches that are longer than you think they need to be, and go deep into the previous row when working subsequent rows. I had a large college project that required bead embroidery and bead weaving. I personally love Mikuyi. In a project that used every style and shape of bead, I found these to be the easiest to needle and the most consistent. I have found that by keeping gold and silver beads in my stash, I almost always have the size and shape that I need. I stick with 15 and 11, Rocaille and Delicas. I only use bugles for fringe. I find that they break too easily. When I had beads to my stash, I add them in a color range. So a few blues, or a few reds. It’s like having a few different colors and weights of the same type of thread. If you’re just starting out. Buy your favorite color in 3 shades and 2 sizes. (That’s 6 packages of beads). When I want all out bling, I go for Swarovski and I prefer sew-ons. I find CZ crystals to be okay for making a bracelet but too inconsistent to sew on. My least favorite thing is to find that I’m discarding one out of every 3 or 4 beads, because the holes are defective. So I skip most other bead companies. Right now I’m working on the Summer of Love Challenge from the SF School of Needlework, so I’m trying to decide where to add beads. For myself, I don’t usually add beads to my embroidery, because they don’t launder all that well. So beads go on items that won’t be washed, or special occasion garments. Just turn the garment inside out and put inside a mesh lingerie bag. I have (and have had) several garments with beads and have no problem with washing them. I have never liked adding beads to my embroidery. Maybe it’s because I have not found any that really improve the overall look of what I’m doing. And if the piece is ever to be washed or laundered, no beads, thank you! If a piece is to be framed, that’s a whole different story. I’m looking forward to reading what others have to say. There are three manufacturers of beads that are easily obtainable – Mill Hill, Miyuki and Toho. I’ve found that Mill Hill are much more consistent in size and hole size than the others and I use them in beaded smocking all the time but they are more expensive. Miyuki are more consistent in size and hole size than Toho and can be found in lots of colors and finishes. I use s #9 darner from Bohin for most beading stitching but not for regular beading like for jewelry. For that I use a beading needle because I’ll be stitching through each bead multiple times. Thanks for your reply regarding the shading. That’s impressive blending, truly. The shading and colors must be even more striking in person. I’ve begun to notice that each book or site I go to in connection with long and short stitching has a different “correct” way to do it–alas. Hi Mary Sorry I’m a day late with a comment (I work WAY too much!) Beads are such a big part of my life! My current favorites are Miyuka Delicas and I love the square beads since they can be interwoven to create a glass fabric swatch. You have done a brilliant job integrating fine beads into your embroidery piece – the outline gives such a beautiful touch. I tend to collect beads made by Swarovski. You can also order lovely beads directly from the Czech Republic using Etsy. The shipping time is just a few extra days, and the shipping cost is no more than domestic. I have all of my beads organized in trays of gem jars. I have the most success adding beads as I go, without a clear advanced plan. The beads and threads work together as the design unfolds. Consider adding some beads with silk thread…really lovely. I’ve only started getting into embroidery recently, the previous craft I identified with was beading. I would probably suggest being cautious with crystals like Swarovski if the embroidered piece will be something that could move around, like clothing or a bag (vs something more stationary, like something that would be framed or displayed), because sometimes the edge of the bead’s hole can wear on the thread and weaken/break it. I don’t know how different types of embroidery threads would hold up compared to beading threads. Having been a sewer for 60+ years I have attempted everything to do with fibre and textiles and embroidery etc. Took up beading 20 years ago with a vengeance and have enjoyed using beadwork in cabochon jewelry and crazy quilting (where anything goes!) and fibre projects. The Japanese do make the best beads – very uniform and thousand of colors and finishes – my favorite is a fringe drop bead. Beads and beading are as old as humans – when you study beads you learn much about history, anthropology, cultures. I recommend Nancy Eha as a fun, creative teacher of bead embroidery – you can find classes online. Ahhh, beads. My first true love. A Delica is a cylinder bead made by Miyuki, a Japanese company. Toho, another Japanese company, also makes cylinder beads. Unlike the traditional seed bead, cylinder beads are thin-walked and exquisitely uniform, as your image shows. They also come in about a gazillion colors and finishes and its all but impossible to buy just one! Everything these two manufacturers make are high quality and as their color-lines are generally spread across all the beads they make, you’ll likely find that lovely blue in their seed beads of all sizes as well as bugle and shaped beads. Seed beads from the Czech Republic are less uniform in shape but come in stunning colors and finishes and their lack of uniformity adds an organic nature to your piece and some of the more wonky beads can go in tight spots. Vintage seed beads from France, Italy, Germany and Czechoslovakia, can also be wonky but they come in rare colors and sizes so small that they require the tiniest threads and needles. I’d advise skipping Chinese seed beads as the finish on the bead is usually not permanent. Finally, when using bugle beads use caution. Their ends are often sharp and will cut most threads like butter. If using them side by side my recommendation is to either put a seed bead at each end or use a thread headers use. My personal favorite is Fireline 6lb or Spiderwire 8lb fishing lines. They both come in a white color which can be dyed slightly using a permanent marker. I first used beads on a beautiful cross stitch of an angel whoses dress is almost entirely of beads. I loved doing it and the Mill Hill beads used were the spherical ones. I have in fact just finished a beaded Russian icon that I bought through a catalogue. It is an aspect of the Madonna. The project included the beads which I believe to be of Czech origin. The kit also included thread and a fine needle. On an amusing note, I have bought 2 other icons through the Russian on line store. It took forever for them to arrive but they did eventually arrived. New Zealand customs must have been concerned over so many little cellophane packs with teeny beads (drugs perhaps?). I was surprised at the amount of official looking sticky tape,but nothing was missing from the kit in question. I attended a basic beading course a couple of years ago and we were told by the teacher that the Japanese beads are a better quality and more uniform whereas the Czech ones can be problematic as they are not uniform and can be difficult to get a needle through so in my opinion it is worth spending the extra money on the Miyiku or Toho beads. Hope this helps. I love SJ Beads. They are absolutely beautiful. Take a look at Susan’s website and I’m sure you’ll agree. I usually order the 500 bead option and they come in lovely little round, plastic containers. Plus, Susan is a delight to deal with. I am a bead addict! I have never met a bead that I didn’t have a purpose for. I see a fabric with a repeating pattern; I think about how much prettier that fabric would be, with beads all over it. If I see beads on sale I buy up as many as I can afford, even if I don’t have a present purpose, it will come to me! I have beaded hats ( many, many hats), scarves, blouses, dresses, pants, purses, shoes, & lately been doing beaded broaches & other pieces of jewelry. I play with a Renaissance group because they loved beads in them there times, in most European countries. I am especially fond of Pearls, both real and glass pearls. They both come in many sizes, shapes, as well as every possible color that one might need/wont. I also like to use real gem beads. I use a lot of Garnets, my birth stone. I love the extra bling beads can give to an outfit. I have a Scarlet, brocade, jacked. I couched around the flower pattern in metallic gold and around the leaf part in a metallic silver braid all over the entire jacket. In between the flowers I applied 1500 gold beads, all over the sleeves and down the front sides. I didn’t bead the back though as I didn’t want to sit thru a long Christmas ceremony with beads poking me in the back; or my hair getting tangled in the beads around the back of my collar. When you are adding beads to a project, you need the beads that appeal to you, beading needles (which there are several sizes to choose from). The hardest part for me has always been choosing the right thread. I have used every thing from dual purpose sewing thread, to very thin wire. I always try out a sample piece, to check out the way it will work with my fabrics. I like to throw this sampler in a garment bag and then into the wash. Esp. if I plan on washing the final projects. This lets me know if the beads are color proof, if the metal one will chip with washing and or wear. As well as how my beading thread will hold up to abrasion. I have had glass beads that would eat thread. It doesn’t take a lot of training to bead an embroidery project. You can find several ways to apply beads from Nancy. You just need to like the finished look! Beads gives a different look to a simple design.It is more like Jewell and be given a designer look to our dress. Try Mill Hill beads: huge color range! Gosh I love this! One quick question…can you explain in a future post about how to do/use a stabilizing thread? 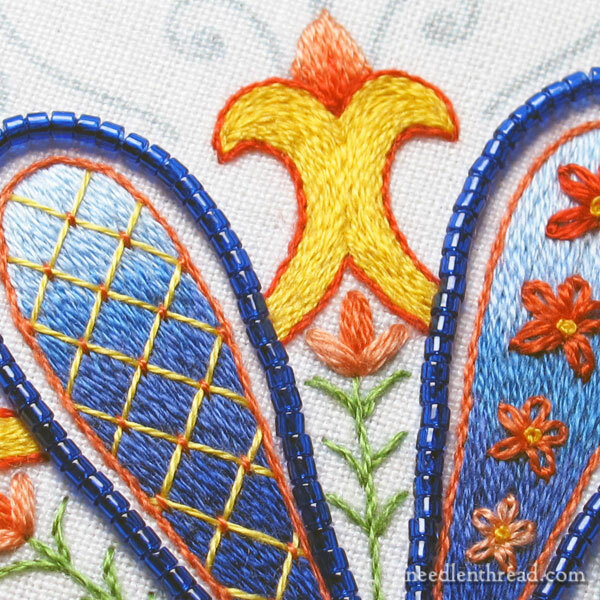 And I just have to pass on a link of a contemporary embroidery artist who uses a lot of bead accents (along with goldwork and stumpwork…I love it all!). Check her out, you won’t be disappointed! Hi, Heather – not quite sure what you mean by a stabilizing thread? Do you mean a thread that can handle working with real metal (Goldwork) threads? Or do you mean something else entirely? Thanks! I think that Heather is refering to your comment about the beads being run through with a stabilizing thread. After couching each bead do you run a single anchored thread through the beads to prevent them from being wobbly? Do you use a beading needle for that? Sounds a little tricky. Ah! For some reason I was considering your question in context with the instagram piece linked to in your comment, Heather, rather than in context with the article. I’ll definitely talk about stabilizing the whole line of beads, when I publish this project in its entirety. And I might write about it before then, too – in fact, I’ve discovered a couple things when stabilizing the line of beads that would be worth sharing. Thanks, Heather, for your question. Thanks, Linda, for clarifying for me! When you say (in your reply to me) you use one strand of floss, do you indeed mean a single strand rather than a single thread? I was practicing with what was labeled embroidery floss the other day, and I noticed it was made up of six very thin strands, three of which I was using for my practice of long and short stitch. If you use a single strand, how do you split each one when you stitch the second and subsequent rows? I’m probably misunderstanding what you wrote. . . .
Hi, Mike – that’s right. You take one strand from the six that make up the whole thread as it comes off the skein. It’s one tiny strand. That’s the best way to get a really smooth surface to stitches like long and short stitch and satin stitch. Wow! Do you actually split the strands when you work the second row? Or do you come up between the strands? Hi Mary: like the rest of your readers I am looking forward to seeing the finished piece. I have never used beads in embroidery, although I have used them extensively in Kumihimo braiding. I didn’t understand what you meant when you said the”beads on the right had not yet been run through with stabilizing thread”. Did you apply those beads individually first and are now going to run one thread through all of them to tie them together? Or do I have it all wrong? In any case my next project (after I complete the 5 I am already working on) will definitely include beads. They really enhance to piece you are working on. Well I really love miyuki beads in all shapes: they are very regular made and have the most beautiful colours! I usually use very small ones: number 15. That means I use beading needles number 12 or 13 when using beads in my embroidery. The beads look great especially when they have been stabilized. Perhaps one of you readers can help me. I have been looking on the net for large beads like the ones which used to be used on crocheted milk jug covers. I have seen them called pony beads. Here’s hoping. Japanese beads are supposed to be the best quality in terms of consistency, that’s Miyuki (incl. Delica, as you almost certainly know) and Toho. Czech beads are supposed to be the next best (I’ve found Precosia to be very good), and finally Chinese. Prices also reduce as you go down this line. Love the way your piece is looking! Size 13 Charlotte cuts have to be my favorite. When I began learning beading in 1988, they were back-ordered at my favorite trading post. Rising Arrow in Sunnyvale, CA had only pale blue and dark brown! One day after the Iron Curtain came down, there came a flood of gorgeous Charlottes beginning with pearl! In a search, “cuts” only means the beads are faceted. Unworthy contenders in size 9 or 10 will crowd forward. Those are for show girls, not our delicate projects. Used on a dress, they will make it impossible to wear! “Charlotte” may get you recipes! Czech Charlotte cuts are size 13 by definition, now available in opaque, transparent, iridescent, pearl and metallic! Shipwreck has a good selection, though I see quite a few colors need replenishing. The metallics are there. While Size 13 is quite small, appropriate needles and threads are available. I would droozle some on a special silk blouse to wear on a dinner date. Or edge a silk scarf with them. However they’re used, these tiny beads are pure joy. Unfortunately, I cannot source them in the UK and they are rather expensive to import from America. I have not used delicas on an embroidery before but am really taken with the smooth line you have achieved with them. I will give that a try in a project I have in mind. I think the contrast between the smooth lines and the sparkly tri-cuts will be rather nice. both Miyuki and Toho make very uniform beads, whereas the czech beads are less uniform, I believe it is because the first are extruded and the second pressed. Miyuki and Toho do vary in size. Their 11/0s are slightly different sizes, I think Toho are slightly bigger. The round seed beads are called rondelles. For your needlework I’d suggest sticking to these Japanese brands as they are much more regular. I’m a few days behind with my inbox…lol…i use a lot of seed beads and sequins on christmas tree ornaments and i found an absolutely marvelous storage system. there are several different type of contains that can be mixed and matched within a unit. the units can be pricey but Amazon sells them cheaper and JoAnne Fabric sells them and with a 50% off coupon, the price becomes easier to take. i store my unit on a book case in a perpendicular position so it only takes up about an inch and a half of shelf space. Also, i have a little DIY tip for bead usage: i lined an unused cd/dvd case with rescue tape and whenever i use beads i sprinkle a few out of the container onto the rescue tape (sticky on both sides) and the beads don’t roll around. i’ve used the same one for a couple of years now and it’s still sticky. Hi, Sharyn – Thanks for your comment. I had a problem with the link working, so I edited it out. In any case, it’s the same bead organization system that I wrote about here: https://www.needlenthread.com/2015/07/organizing-beads-for-embroidery.html – I use them, too. They were on clearance recently, and I managed to get a few more sets at the clearance price with an extra 25% off, which made them very affordable. I like them a lot! I’ll be writing about beads again later this week. Can you explain a bit about how you stabilize the outlining beads? I looked at other bead related posts, but did not find anything. Love your posts. Hi, Carol – this is my design, actually. I’ll be making it available later on this year, right here on the website! Was that short and long stitches on the leaves?